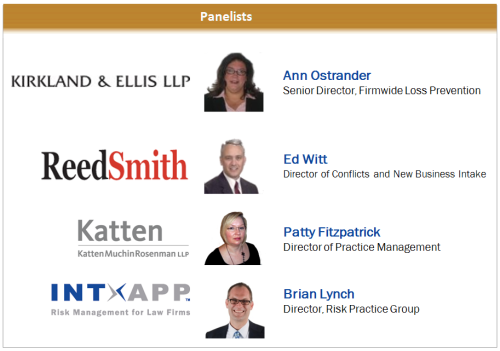 Description: Today, law firms face unprecedented risk and compliance challenges. Whether dealing with increasing client concerns about potential data leakage (tied to WikiLeaks and recent law firm insider trading scandals), stricter regulatory requirements that now extend explicitly to law firms, or responding to a variety of rules affecting firms practicing across jurisdictions and international borders -- the job of a risk leader is not getting any easier. And the stakes are getting higher. Attendance: Attendance is by invitation only. Risk Roundtable members and qualified parties are invited to request more information by emailing: info@riskroundtable.com. Conflicts Curtailing Counsel Career Changes?